Al Kammerer is the winner of the 2010 Willa Pilla Award, for “‘Bianchi’: That’s Italian for Little Tiny Bicycle Seat.” The Award was presented by Bob Thacker, the previous year’s recipient, who had encased the “pilla” in a ziplock bag due to fear of contagions. The presentation of the Willa Pilla Award during the WLA Saturday business meeting is a favorite conference ritual. The Willa Pilla is awarded as way of acknowledging the long tradition of western humor and is given to the funniest paper delivered at the conference. The winner receives the ceremonial pillow (or pilla) and is crowned with the Willa Pilla Award Hat, both of which the winner is allowed to keep in his or her possession for a full year. At the conference the next year, the winner passes on the pilla and hat to the new awardee. I’ve pasted in below several comments posted by Al since winning the award and about the pilla itself, which we are all happy to know, made it safely to Duluth (its new home for the year). The Willa Pilla, after a turbulent ride in the cargo hold, is safely in cold storage here in Duluth. Due to Bob Thacker’s qualms about micro and macro organisms accruing on or about the pillow, I’ve taken the liberty and considerable expense of placing it in a brand new zip lock bag and destroying the old one. Let me say that there is nothing I wouldn’t do to fulfill my duties as this year’s recipient and reigning king of comedy in the west. I’m also willing to do nothing itself. There is an amazing Willa story from the Pilla’s sojourn here to Spearfish, but I’m (mostly) hoarding it for this year’s presentation introduction of the award. A couple folk, such as Sabine and Dru, know the story. A tantalizing hint: It concerns a Black Willa spyder. Now that it’s been revealed, teasingly, that the pilla may have the eggs or full embodiment of spiders, I am upgrading the pilla from regular strength zip lock to a heavy-duty, freezer grade one and removing it from under my pillow to an unatttached garage. With all due respect. I will stand the considerable expense of this two way protection gladly due to my respect for this honor that can only be compared to the Fishnet Leg Lamp of Christmas Story which is available online, unlike the pilla, for 49.95. I would ask that none of the elements of humor be moderated in my postings. The lightning bolt quality of the humor must be carefully preserved and protected from censorious moderators who would reduce my comments to the level decried by Twain as lightning bugs. Feel free, however, to place disclaimers before and after any and all offenses reasonable persons or committees might find that are against good taste or the common good. Any rebroadcast, however, is strictly prohibited without the expressed written consent of major league baseball. Thanks to Pam’s post on the forthcoming Coen Brothers film True Grit (a new adaptation of the novel rather than a remake of the 1969 film), I’ve been thinking about the original True Grit film with John Wayne, which I don’t believe I’ve seen in many a year. It was a kick to look back at the trailer of the film. I remember True Grit vividly as one of the first (if not the very first) “adult”movies (that is, not a film intended for children) that I saw. Having looked back at the trailer, I realized, however, that while my memory of the experience is vivid, I recognized very few of the details. In fact, as with many movies from my childhood, I actually remember the Mad magazine parody (dubbed True Fat: “I’m looking for a man with true fat”) in more detail than the actual film. There’s a whole (everchanging) list of tweeted failed westerns available as well. Click here for the The Best Failed Westerns List. There’s a lot of repetition of names (e.g., Pasty Rider), and I figure that the readers of the WLA Blog could do better–if only because we actually know more westerns than the few that keep getting repeated. Feel free to use the comment link to post your own Fail Westerns. I’ve pasted in a couple of recent posts as samples. Anyway, it’s a simple formula, and I initially thought it seemed very adaptable to Edgar Allan Poe’s short stories in particular, as many of Poe’s protagonists have plenty of reason to exclaim “FML!” So, I started thinking of FML versions of Poe’s stories, and below are some examples of what I came up with. Today, I axed my wife in the brain, hid her corpse behind a wall, and nearly got away with it. Just as the police were leaving my house, my black cat, which I had accidentally entombed alive with my wife, started hideously yowling. FML. Today, I buried my sister in a vault deep beneath our family mansion. Turns out, she wasn’t really dead. FML. Today, my friend Montresor invited me over to share a really good glass of Amontillado. When I got there, he chained me up and entombed me behind a wall. I never got to taste the Amontillado. FML. Today, I gave this really awesome party. Everyone was dressed in masks. By the end of the party, everyone was dead. FML. Today, I killed my friend with the hideous eye, dismembered his corpse, and hid it beneath the floorboards. Just as the police were convinced of my innocence, I started hearing my friend’s still beating heart, which got louder, louder, LOUDER! FML. As a formula for literary parody, I think FML is very adaptable. Twain FML: Today, I found this wonderful dead rat and a piece of string to swing it on. I was having a great time, until I saw my friend Tom, who wanted to trade for my rat, so I did. In exchange, I got . . . to whitewash a fence. FML. Today, my long lost uncle appeared out of nowhere. See, I met this great guy awhile back, but my family doesn’t like him. They have issues because he’s “different.” So Uncle Ethan, who claims he’s been “searching” for me for years, showed up and made a really big scene. I was so embarrassed. FML. Today, I killed a notorious outlaw just as he shot down my friend. Now, however, everyone thinks my friend is the man who shot the outlaw. Including the woman I love! FML. So, that’s all I’ve been able to come up with so far. I hope you’ll help me out and rewrite the western book, story, or film of your choice as a FML post. Please feel free to use the comment function to post your own FML (Western Version). The presentation of the Willa Pilla Award during the WLA Saturday business meeting is becoming one of my favorite conference rituals. In Boulder, the presentation was somewhat upstaged by the absence of the winner (early flight) and the spectacle of a past WLA President firing rubber bands (with the aid of a wooden pistol) at the current co-Presidents and the future President (who provided the gun and rubber ammo). In addition to the presidential targets, there may have been some collatoral damage to the membership as well. The Willa Pilla is awarded as way of acknowledging the long tradition of western humor and is given to the funniest paper delivered at the conference. The winner is awarded with the ceremonial pillow (or pilla) and crowned with the Willa Pilla Award Hat, both of which the winner is allowed to keep in his or her possession for a full year. At the conference the next year, the winner passes on the pilla and hat to the new awardee. The presentation speech by the old winner (wearing the hat for one last time) and the acceptance speech of the new Willa Pilla champion is often the funniest five minutes of the conference (especially if I’ve missed the presentation of the paper that won the award). 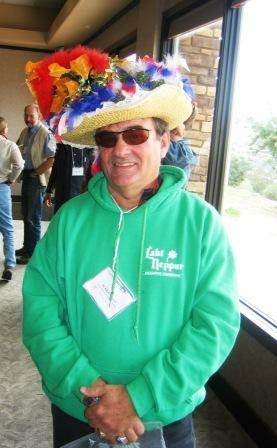 My favorite moment is probably John Price’s presentation of the hat to Beth Kalikoff at the 2007 Tacoma Conference, mainly because of John’s parody of the Thursday lecture by Distinguished Achievement Award winner Sherman Alexie (John: “Just because you gave me this award–you don’t own me!”). Well, maybe you had to be there, but whether you were at the conference or not, anyone can appreciate the fashion-forward styling of the Willa Pilla Hat. Thanks to Sabine Barcatta for sharing photos of Willa Pilla Award winners.